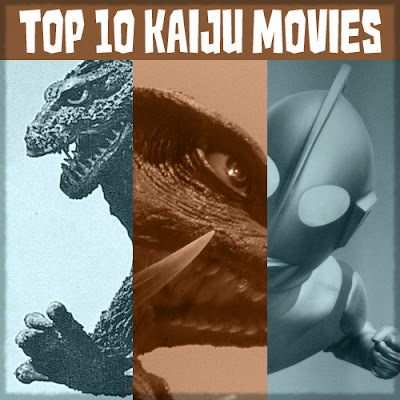 What are your favorite top 10 Kaiju movies? Goji from GojiGuy.Tumblr.com lists his top ten Kaiju Movies. Do you agree? Check out his list below. And visit Goji's Den. Kaiju cinema is a subgenre so large and long-running, it is hard to believe the term “kaiju” is only now entering the movie-lover’s vernacular. Birthed in Japan by the original “Gojira” (Godzilla) film, it is a genre that incorporates science fiction, fantasy, drama and sometimes even romance. It is Japan’s earliest pop-culture sensation, and has spread across many mediums like manga (Attack on Titan), anime (Neon Genesis Evangelion), and even video games (Wonderful 101, King of the Monsters). With the recent release of Guillermo Del Toro’s “Pacific Rim,” a new light is being shone on Kaiju cinema in the west, so I’ve put together a list that is a great starting point for those now interested in the genre. As a note, some of the dubs for these films are absolute -treasures- while most deserve to be watched in their original language with subtitles. I’ve made mention for each film. The one that started it all. It’s hard to say something about this film that already hasn’t been said. It’s a chilling, thrilling monster romp that mixes important themes and a nuclear message with great entertainment and fantastic performances. Still the kaiju film to beat. The american version, Godzilla King of the Monsters stars Raymond Burr and is a very interesting and loving recut of the film. Worth a watch and available in the fantastic Criterion set. I know I’m cheating by including three films in one spot, but the trilogy needs to be viewed as a whole. Each one is unique in tone and each one absolutely rocks. This is a modern take on the classic Gamera monster and it mixes ancient civilizations, biotechnology, alien invaders and mysticism into a delightfully entertaining package. The films start out fairly light-hearted but by the third film, things take a turn for the dark and serious. Stick to JPN with subs. This is the quintessential 60s Godzilla movie. Colorful, fun, well-scripted, and featuring great performances from some of the most notable actors to ever star in the franchise. It’s very “space-age-sci-fi” and unique in tone from the other Godzilla films on this list. The dub is my preferred viewing, due to it keeping Nick Adams performance in tact (and keeping the famous “You rats!” line!). This is Ishiro Honda’s (director of Godzilla, majority of sci-fi stuff at Toho) color epic masterpiece. The film that inspired Brad Pitt to get into acting (no joke) and a favourite of directors Guillermo Del Toro and Tim Burton. This takes the Kaiju fable, and injects it with a lot of personality as the two warring gargantuas are actually brothers. The dub is ok, but the subbed version is preferred as it preserves the excellent soundtrack by composer Akira Ifukube. Godzilla vs Biollante The only “modern” Godzilla film on the list, Biollante is a mutated rose with the soul of the daughter of a scientist trapped within. It sounds pretty goofy but it’s played fairly straight (and the beast is both hauntingly beautiful while also being terrifying and menacing). This film was the first Godzilla movie to be taken over by a new generation of filmmakers, and it shows. It has psychic children, international strife, gunfights, and crazy new bio tech. It also has an excellent and very unique soundtrack that incorporates electric guitar and fast beats. Dub or sub, either is fine. Sub will have better AQ, though. I tried counting the number of explosions in this film on three different occasion. On each occasion I lost track. This movie is a balls-to-the-wall 90 minute slugfest between 50 Ultramen and 100 Kaiju. Created as a celebration of all things Ultraman, it has some of the most elaborate and sprawling Kaiju fights in the history of the genre. It’s light on plot and character, but VERY heavy on action. And that’s just fine by me. Pacific Rim Ahh. The summer blockbuster Kaiju fans have been waiting for. Pacific Rim earns its spot on this list. A loving homage to Kaiju, Mecha and tokusatsu, this film will take you for a ride. The glistening special effects are excellent, but they don’t take the place of plot; the characters in this film are as interesting as the giant mech vs kaiju battles! Godzilla vs Mechagodzilla It’s hard to restrain myself from filling this list with Godzilla films, especially the classic “showa era” ones. But this one is special. Created for Godzilla’s 20th anniversary, it has the big guy go up against an alien-made mechanical doppleganger! Mechagodzilla is an excellent villain, he even tries to kill Godzilla’s friend, Anguirus, so the monster drama plays out almost like a classic martial arts revenge flick. Super 8 Ultraman Brothers The “Last Action Hero” of Kaiju films. Has a young man having to recall the shows featuring his childhood heroes to save the planet as the monsters he thought were only on television start to show up in the real world! Brilliantly crafted miniature sets, mixed with nice pacing and some comic relief make this an excellent family-friendly entry, loaded with nostalgia. Kind of surprised to see that neither Mothra or Rodan made the list. Godzilla: Final Wars had it faults, but I still think it's one of the best of the lot, and Giant Monsters All-Out Attack had the best bad-guy Godzilla, though it did tweak a lot with Mothra and Gidarah. What about the original King Kong? Is it technically not a Kaiju movie, because it wasn't a Japanese movie? But there was the King Kong vs Godzilla movie, as well as at least one Japanese Kong movie, King Kong Escapes, which was pretty fun in it's own rights. JazzAct13, I'm totally with you, King Kong deserves recognition. Merian C. Cooper's original King Kong is what inspired Godzilla. And we all know Godzilla inspired the rest! Thank for the comment! I'll have to keep an eye out for that Ultra Galaxy Legends movie, that looks like it could be fun.